Our Furry Flyer program is one of the easiest ways for you to help the animals. If you have a computer and printer of your own, we’ll send you a monthly poster (a.k.a. a FurryFlyer) that you can print out and post at your workplace, school, gym, or local store. Choose a location that you already regularly visit to keep things simple. The cost to you isn’t much more than a piece of paper every month and you’ll be helping to spread the word on adoptable animals, pet-related events and WHS fundraisers. You’ll start receiving a Furry Flyer at the beginning of each month. 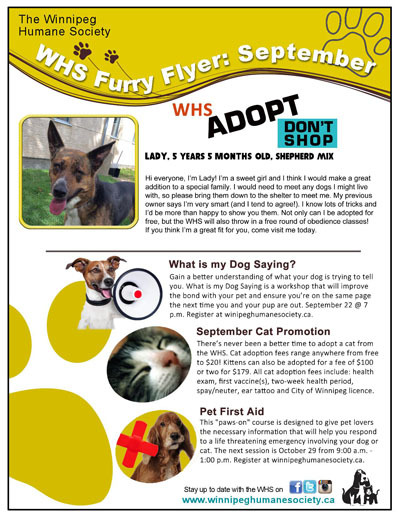 Download the September 2016 Furry Flyer here! — and get started right away! Please be responsible about your posters. Always ask permission before you post anywhere and always remove outdated posters.